Like this video says, Dickie Post was, for a short period, one of pro football’s most elusive runners. He was a short-lived sensation in San Diego, and would have enjoyed much greater success if he had not taken such a beating playing the game. The American Football League had two rookies of the year selected in 1967; San Diego Chargers running back, Dickie Post, and Houston Oilers linebacker, George Webster. 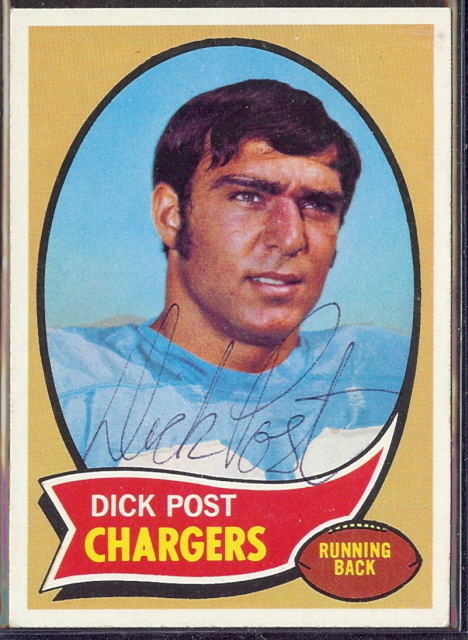 Dickie Post came to the Chargers after spending his collegiate years at the University of Houston. A 5’9″, 190-lb scatback, Post had a fast and furious running style, and the ability to change direction on a dime. In his first year in the league, Post rushed for 691 yards and seven touchdowns, and caught 32 passes for 278 yards and one touchdown. After the season ended, Post made the first of his two career trips to the AFL All-Star Game (1967 & 1969). Dickie Post had a short, but successful career in professional football. He spent four years with the Chargers, leading the league in rushing average in 1968 (5.0 yards/carry) and rushing yardage in 1969 (873 yards). Post played two more seasons in Denver and Houston, before retiring after the 1971 season, and returning to his cowboy lifestyle in his native Oklahoma. 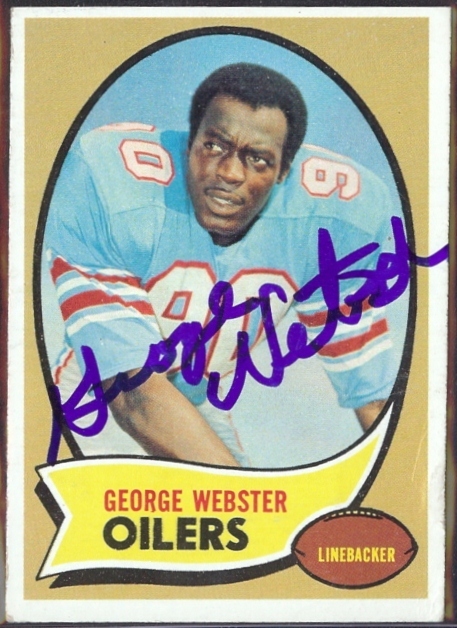 George Webster was a 6’4″, 220-lb defensive back at Michigan State before the Houston Oilers selected him with the fifth overall pick in the 1967 AFL Draft. He was immediately moved to linebacker, where his rare combination of size and speed quickly made him one of the league’s most dominant defenders in the latter half of the AFL. George Webster averaged more than 10 tackles per game in his rookie season, added one interception, and made his first of three AFL all-star appearances (1967, 1968 & 1969). Despite playing in only the final three seasons of the American Football League, Webster was named as an outside linebacker on the AFL’s All-Time Team. After 5.5 seasons with the Houston Oilers, Webster spent the next 4.5 years in Pittsburgh and New England, before retiring with the Patriots after the 1976 season. George Webster’s post-football years were marred by pain from injuries suffered during his playing days. By 1989, he had lost most of the use of a hand, foot, knee and ankle due to football-related injuries. In 2002, Webster had to have most of his right leg amputated due to poor circulation despite many previous surgeries. George Webster died of heart failure in 2007.